Dubai, 14th September 2017: Today marked the official inauguration of King’s College Hospital London’s (KCH) new Medical Centre in Jumeirah. The new facility of the London-based, world-renowned teaching hospital, is set to deliver world-leading expertise and enhanced patient journeys across more than ten specialties including paediatrics, fetal medicine, diabetes, and endocrinology. The inauguration was attended by high-level executives and VIP dignitaries including, H.E. Humaid Al Qutami, Chairman of the Board and Director-General of the Dubai Health Authority; and representatives from KCH UAE’s three joint venture investors; H.E. 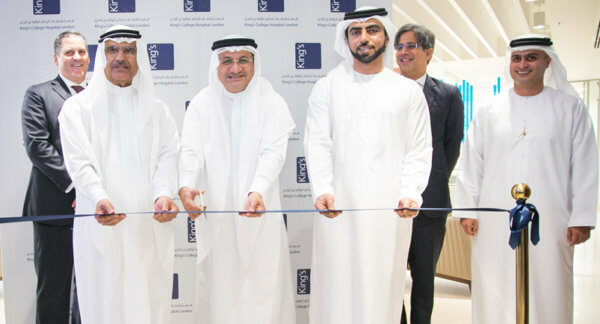 Ahmed H. Al Tayer, Chairman of KCH UAE; Khalid Bin Kalban, Managing Director and CEO of Dubai Investments PJSC; and Ahsan Ali, Head of Business Operations and Healthcare, Ashmore Group Plc. “There is nothing more important to us than our patients’ needs and supporting the UAE’s impressive healthcare vision of providing access to quality healthcare through a best in class primary, secondary and tertiary care network of facilities. That is why we’ve brought over 175 years of King’s experience and our unique evidence based healthcare approach to the UAE. Working in close collaboration with an extensive care network, our dedicated team of healthcare professionals will provide the very best of British end-to-end healthcare, across a range of disciplines. Helping to not only service the needs of the community but also further our ambitions to be the local healthcare provider of choice,” Neil Buckley, CEO KCH UAE said at the launch. “We have three core healthcare concepts that we are launching for the UAE market; the London Faculty, the London Neuroscience Academy Programme and the Multi-Disciplinary Case Review Boards. The London Faculty gives access to a large pool of the world’s best clinicians from the UK who are an integrated part of our patient pathway and who will be in the UAE every four to six weeks. During the intervening period, their day-to-day involvement with our UAE’s doctors and patients is maintained through telemedicine and through our local KCH clinicians,” explained Mr Buckley. The first three visiting experts this year are Dr. Marco Sinisi, a world expert in peripheral neurology and pioneer in peripheral nerve injury; an expertise that has not widely been available to patients previously in the UAE and is highly relevant given the number of road traffic accidents which is the major cause. Prof. Nigel Heaton, a global leader in liver transplantation, who is preparing to offer paediatric liver transplant operations locally from when our hospital opens in early 2019. Dr. Bu Hayee, the pioneer of a new endoscopic technique that, along with associated weight loss, has an ameliorating effect on diabetes. “These are services not seen in the UAE to date and specialisations that are very relevant and much needed for this region. In fact, Dr. Marco Sinisi, the first of our London Faculty to visit the UAE, was actually just here seeing patients at our Abu Dhabi clinic last week. His visit was extremely well received and his fully booked schedule included two follow up patient consultations. Originally, these patients had to fly to the UK to see him, but now, through this new programme we have brought him here to them. He will also be back before the end of the year to perform a number of peripheral nerve injury procedures locally,” Mr. Buckley added. UAE based KCH patients will also have access to Multi-Disciplinary Case Review Boards which are panels of twenty to thirty world leading clinicians, from the UK, providing bespoke expert treatment plans for complex individual cases in cancer, cardiology and neurology, where cutting-edge healthcare is required for KCH patients in the UAE. The London Neuroscience Academy Programme, founded by eleven world leading Neurologists from King’s College Hospital London, will be hosting symposia, led by visiting Neuroscience specialists, in the UAE every two months. The programme will enhance capabilities in the Emirates by improving efficiencies in the local sector and UAE healthcare professionals (HCP) knowledge of new ground-breaking techniques and developments. Open to the industry, the next symposium will be held in February 2018. All these initiatives help keep patients in the UAE for treatment and rehabilitation, removing the inconvenience and expense of travelling overseas to seek world-leading expertise. “There is currently about AED 1bn worth of outward-bound health tourism revenue lost to the sector every year. This is because the market is subject to certain gaps in specialised clinical procedures and expertise that we are here to close,” Mr. Buckley added. The medical centre in Jumeirah follows into the footsteps of KCH’s flagship medical and surgical centre in Abu Dhabi and precedes an upcoming Dubai Marina based medical centre and a Dubai Hill’s based tertiary care hospital. To find out more or book an appointment please visit https://kingscollegehospitaldubai.com/ or call 04 378 9555. King’s College Hospital London Medical Centre Jumeirah is located on 12 37 B Street in Jumeirah. Google maps directions can be found here and valet parking available. The clinic will specialise in family medicine, paediatrics, obstetrics and gynaecology, foetal medicine, internal medicine, diabetes, endocrinology, ENT, dermatology as well as dentistry.